that looks very nice. Two questions. how long did it take you? and... wgere are the NEM coupler pockets? Hi Marty and many thanks. The chassis took about two and a half hours to build. To be fair most of this was continually referring to the instructions and understanding the construction methods. I think that the next one should be about an hour - especially as I plan to 'cheat' but designing and printing my own axle box covers rather than relying on the laminated etch method provided in the kit - these were the single most difficult part of the build, everything else was fairly easy. No NEM pockets on a 2mm finescale kit! This doesn't concern me too much as I plan to use some of these as semi fixed rakes. The chassis is currently running on finescale wheels which are somewhat sensitive to n gauge track. 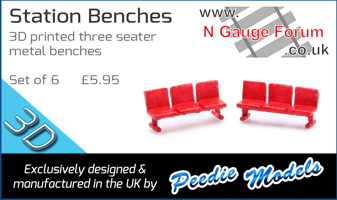 The 2mm association thoughtfully supplies appropriate axles to convert Farish wagon wheels to run with these kits as the chassis is designed to accept a 12mm long axle while Farish's and Dapol's are around 15mm in length. Well my theory regarding producing white decals didn't work out so I'm now thinking how I can achieve the custom transfers I require cheaply. Cattle vans is the main theme here and I've got three to build, one ex GER (the plastic mouldings but awaiting a suitable chassis to complete), one ex GNR and one early LNER (the etches). I've also got a couple of 9'6 wheelbase chassis to build which hopefully will fit my 3D printed GNR clerestory vent I designed last year. I've also splashed out on some nice buffers that have been cast in brass, some adaptor axles (to fit the etched chassis) that'll accept Farish wheels and some etched 'w' irons that'll be used for a couple of other projects. I'm looking forward to further improving my soldering skills (or lack of!) and would be happy to post construction photos of my progress if these would be on interest to people. Taking the chassis etch, the first job was to cut out the main chassis part, open up the bearing holes slightly and solder in the bearings. I used solder paste and soldered from the front face to ensure I didn't get any solder inside the bearing surface. Then I folded the 'w' irons and brake gear hangers before testing it with wheels (Farish on the 2mm conversion axle) to make sure everything was free running and level before testing with the body and making adjustments to fit as required. Next up were the sole bars. These need to be folded up from the three layers pictured below to get the correct chassis width. Unfortunately, things weren't quite that simple with this kit. The sole bars supplied with the chassis are unsuitable for the cattle van due to the van's length. Substitute sole bars are supplied with the body kit for this purpose and were added as the topmost layer instead. Next I cut out the brake etch from the fret. This is a clever bit of design as it is also a simple fold up piece that sits in etched slots in the main chassis. Once in place solder paste was applied to the handy access holes in the etch and soldered solid. After this, I threaded some 0.25mm wire through the brake hangers and soldered up. Apologies for the horrible photos (my phone camera) and I hope that the above makes sense to somebody other than me! I've mostly built the GER cattle wagon today. Not going to go into this one as it's just a plastic kit mounted on an etched chassis similar to the one above. However, I've been playing with some of the 2mm Association's etched 'W' irons and came up with this this evening. I'm definitely staying as an N gauge modeller for the time being so it'll need to be able to traverse just under a 10 inch radius! The current plan is to use 2mm adaptor axles with bearings on the outer 'W' irons and simply ream out the bearing holes on the inner ones and use standard Farish wagon wheels and axles. I hope that there will be sufficient side play to allow it to get around curves. If this fails my fallback position will be to place the inner wheels in a drill and file off the flanges. Fingers crossed that one of these ideas works! All gone a bit quiet again here so in an effort to get some modelling done I've been playing with the old Farish bogie sulphate wagon. I stripped the wagon back down into it's component parts and then filed the top of the bogie pivot down to the same height as the bogie stretcher. Sorry about the poor quality photo but hopefully you can see the difference this makes in the height of the wagon (left) against an unaltered one (right) and how much better the model seems with a minimal gap between the bogies and solebar. The wagon is now almost 2mm lower and will still go around a 9 3/4 inch curve to boot! I've also changed the wheels for modern Farish ones - I've got some correct 3 hole wheels somewhere but they've eluded me so far today! The bogie stretcher is the piece that runs between the two outer side frames and connects to the pivot hole, nothing to do with the green stuff at all I'm afraid! Following a somewhat down and out Christmas, I felt like I'd lost my modelling mojo again. However, I picked myself up and went to the Stevenage show last Sunday. 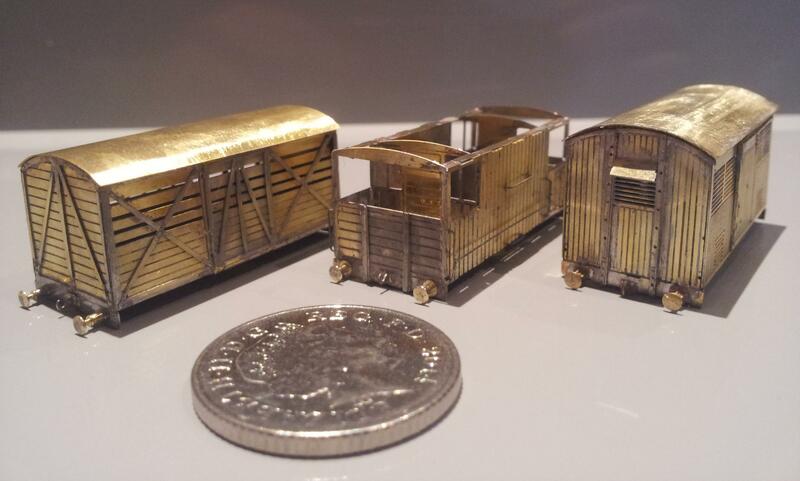 While there, I came across the BH Enterprises stand and found several etched brass kits. These are all re-releases of kits originally produced in 1991 and included to my joy, a GCR fish van and a GNR brake van! Anyway, I've finally managed to do some modelling for the first time in six or seven weeks yesterday by soldering up the for kits. Three of them are pictured below (the four, another GNR brake van, is drying having received a squirt of primer). From left to right: GCR fish van, GNR brake van, LNER/NER perishables van. I'm looking forward to getting some more of these! Ray at BHE was kind enough to let me pop over last night and buy some more of his wagon kits. I'm now the owner of another brake van, fish van and three fruit vans. I did also get another perishables van but the etch isn't great (badly etched with most of the detail lost) so hopefully Ray will let me swap it for a better example. I'm toying with the idea of making the latest GNR brake van as a six wheel version (it's too short for the 8 wheeler!). This wouldn't be strictly accurate as all the photographs I've seen of the six wheel brake van had horizontal planking (the kit represents a van with vertical planking) but it's be close enough - and better than anything I could scratch build. This will mean however that I cannot use a Peco chassis as the kit was intended. Luckily I've got several of the 2mm Association's 'W' iron kits (as per a previous post) so these will be used along with a bit of scratch building.